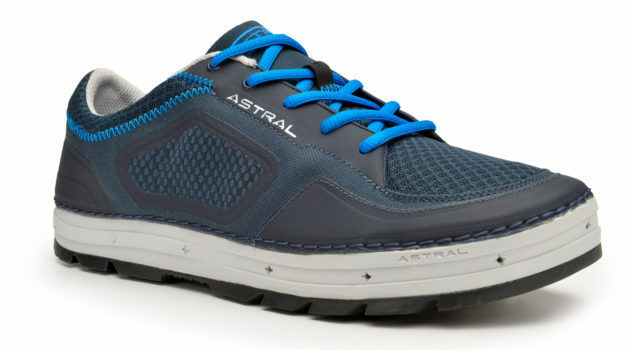 If you are looking for a multi-sport shoe that can dig in the dirt as well as it plays in the water, you have got to check out the Astral Aquanaut. These bad boys are perfect for kayaking, hiking, and fishing, yet they’re still stylish enough to wear around town. When I first got these shoes, I had only planned on wearing them for “outdoorsy stuff”. But they were so darn comfortable (not to mention lightweight) that I found myself reaching for them every time I went out. So what makes the Aquanaut so great? This dedicated hiking shoe combining Astral’s expertise in traction for water sports with a more rugged build for use on the trail. The Agro outsole and flexible, balanced geometry midsole provides confidence on trail or riverbed, with central lugs in the outsole for traction in loose dirt, surrounded by a high-surface perimeter for grip on slippery river rocks. There’s fine-screen ripstop mesh on the sides, tongue and vamp that blocks debris, sheds water and ensures quick drying. The closed-cell EVA midsole cushions the foot and its drainage ports channel away water. As I mentioned before, the Aquanaut is incredibly light, weighing in at just 9.17 oz. Compared to my old hiking shoes, it’s a night and day difference, and I could really feel the difference on my feet after a long hike. The trade off is slightly less foam padding, which may be an issue for those used to more cushy trail runners. Overall, I couldn’t be happier with the Astral Aquanauts, and I highly recommend them to anyone with a love for the great outdoors. Once you experience them for yourself, you’ll never go back to anything else.